The complete waterproofing, crack isolation, and substrate reinforcing system for use with all decorative coatings. Replaces tar paper, wire mesh, epoxy flood coats and EPDM at a fraction of the cost! 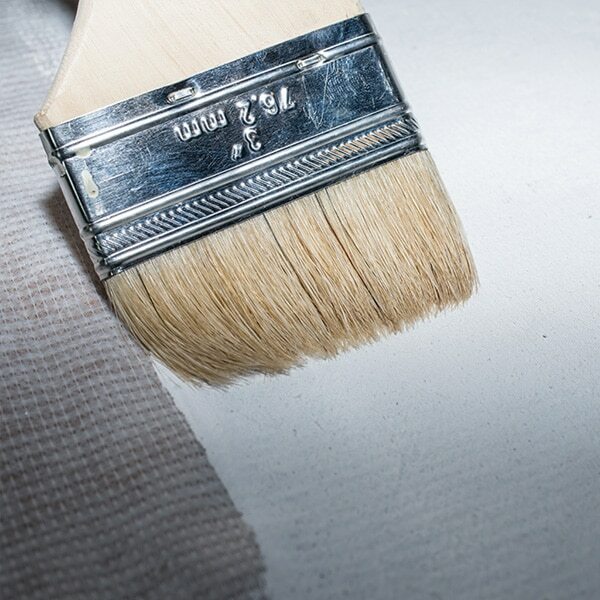 Spray, brush, or roll (use 3/8” roller) to apply a foundation coat of Primer onto an area a little wider than the fabric and approximately 3′-4′ long. Apply fabric into this wet area. Working from the center out to the edges, use hands, brush or roller to smooth it out, forcing the base coat to come up through the material. Leave no wrinkles or air pockets. Apply a second coat on top of the fabric, and roll flat until no white fabric is visible. PerfectMembrane®, The only way to waterproof and prepare decks for coatings and overlay systems. Cracked or leaking substrate made from concrete, wood, tile, etc. Once cured, is ready to bond directly to decorative cement, epoxy, etc. What does the PerfectMembrane® do? Overlay adhesion primer: Bonds decorative coatings to concrete, wood, tile or existing coatings, without grinding. Waterproofing membrane: Converts any surface into a waterproof deck. Ideal for roofs, balconies, bathrooms, etc. Reinforces weak substrates and weak or severely cracked surfaces. Perfect for going over existing coating systems. PerfectMembrane® combines perfectly with your decorative coatings. The only underlay system specified for the overlay industry. Inexpensively and properly prepare and waterproof all deck surfaces for your decorative coatings. Bond your overlay and coatings to even the most difficult surfaces. PerfectMembrane® bonds to various clean substrates including: Paint, adhesives, ceramic tile, sealed concrete, VCT, epoxy, masonry, carpet, wood, etc. Balances substrate pH for superior long term adhesion. Safe and easy to install. Applies by roller or brush. Non-Toxic. One part coating. Clean up with water. VOC free. Primes and seals to create uniform coatings adhesion. Eliminates the need to dispose of soy gels and grinding debris. Bonds to acrylic, urethane, modified cements, or epoxy. Nationally specified for use with all concrete overlay and coatings systems. For use indoors and out. 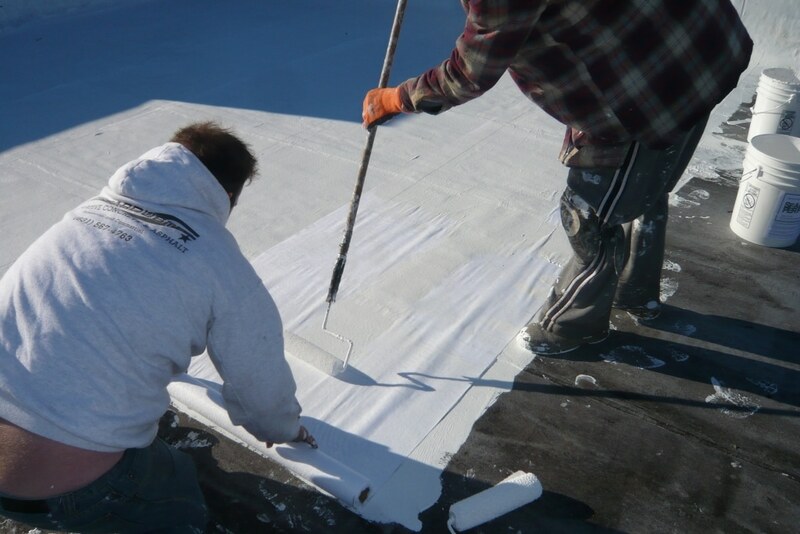 Eliminates the need for tar paper, EPDM, or epoxy and sand floodcoat. PerfectMembrane® is made on site from our PerfectPrimer and Polytex fabric. PerfectPrimer: 40 sq. ft per gallon. Polytex fabric: Choose your roll size. For example, if your project requires 400 sq. ft of membrane, you will need: Ten gallons of primer (40 sf per gallon x 10= 400 sf.) Plus a minimum 400 sq. ft. roll of fabric. Or Simply choose one of our membrane packages. PerfectMembrane® – 475 Sq. Ft.
Sand-Rich® – 275 Sq. Ft.
Manufacturers of flexible waterproofing and decorative overlay systems & coatings for decks, flat-roofs, patios, etc. Copyright © 2017 Specialty Solutions manufacturing, Inc. All Rights Reserved.